This big screen adaptation of some Edgar Rice Burroughs work that I’ve never bothered to read comes off like a really long live-action Saturday morning television show, probably something akin to Land Of The Lost. Cheap sets (couldn’t they at least thought about going outside and finding real caves? ), clunky monsters flying around on fishing line (don’t even bother trying to hide the fact that these things are just being pushed around by off-screen stage hands), and lame pig-faced people that were obviously ripped off of that one episode of The Twilight Zone are the order of the day! 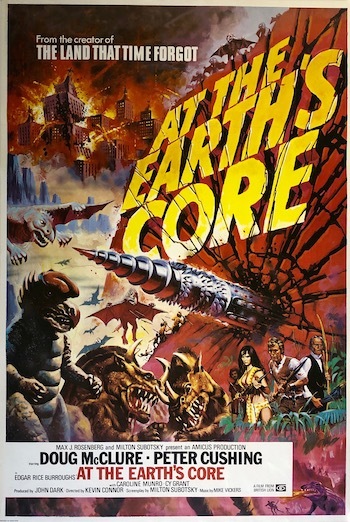 Things begin in Wales where Dr. Abner Perry (Peter Cushing) and his buddy David Innes (Doug McClure) are piloting an earth-drilling device that’s rigged up to drill through a mountain. While they’re doing that, a train will try to beat it to the other side. 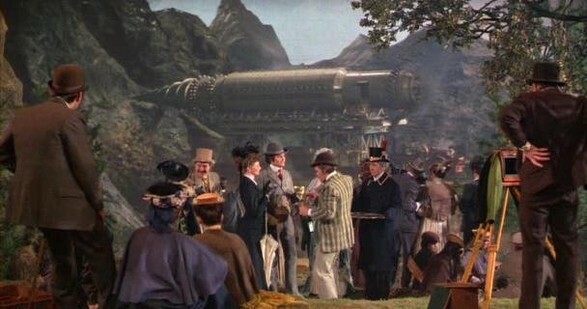 Something goes heinously wrong though and their fancy gauges show that instead of going across and through the mountain, their dang ship is headed straight down! There’s a lot of that Star Trek-style ship-in-distress action where buzzers are going off, lights are flashing, McClures are sweating and the actors have to throw themselves around the cabin like they ran over some really big potholes. Soon, everything settles down and they crash smack dab into the Earth’s core! Perry and Innes get out to have a look and are stunned to find lots of strange fake-looking plants, weird lighting and paintings substituting as the background! Then they are even more stunned to see that this weird world is populated by lumbering fiberglass monsters that look like they will tip over just as soon as eat you, since they appear to be off balance most of the time they’re slowly moving toward you. When Perry and Innes run from this lame upright dinosaur thing screaming for their English nannies, they manage to get themselves captured by the pig-people (official name: the Sagoth). 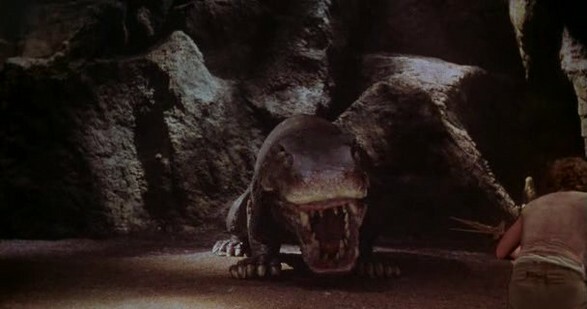 Along with them, there’s also a bunch of other Pellucidar natives that have been captured as well. This includes a motley crew of people such as the lovely and heavily made up (especially for living in the earth’s core) Princess Dia (Caroline Munro). I was never quite sure what exactly Dia was princess of, especially since Pellucidar was ruled by these goofy looking pterodactyls called the Mahars, but she seemed to have good command of the skimpy animal skins she wore, so you can better believe that as soon as Doug McClure sets his 75 year old eyes on her he was ready to free Pellucidar from the terrible grip of these smelly dino-birds. Innes sees this and immediately punks the Sly One. This makes Princess Dia mad. As one of the old timers in the slave group tells our heroes, once you punk a dude on Pellucidar on a chick’s behalf, she is yours but you have to kill any other man who wants her. This is a big deal with Dia because the Sly One works for a man who has a claim on Dia. This guy has the less-than-promising name of Jubal the Ugly One. Now, when Jubal finds all this out, he’s going to stomp Innes into a nice little B movie actor grease spot. Down into the mines Innes, Perry and the rest of the prisoners go. Soon they get to the area where the Mahars are located. These things hang around up high on the rocks resting and doing little until the humans are brought in. Then they have the Sagoths split them up into groups so that they can be assigned tasks to do. Perry is sent to the Mahars library where he spends his days working on translating and copying great works while Innes is sent off to the mines to break up rock. Once he inevitably breaks free, Innes catches up with Perry, who has figured out that all the Mahar come from some egg-like thing in the middle of a lava pit. There’s more trouble outside when Innes has to fight the Ugly One (Innes wins with an assist by some gassy mushrooms) and Perry teaches everyone how to use bows and arrows. There’s a final dull raid and then a final dull goodbye as Mr. Mole gets all fixed up and somehow or other Innes and Perry have purchased brand new clothes for the voyage home. A silly, juvenile experience marked by the expected wooden performance of McClure and the unexpected stink job put on by Peter Cushing. Usually Cushing can be counted on to lift a pathetic film up (see The Blood Beast Terror or The Satanic Rites Of Dracula), but here, his take on the Perry character is as thin and stringy as his hair. His line readings will leave you with headaches as he tries to be a wacky scientist who is over-enthusiastic. You’ll wish he was one of those old guys who get sleepy around four in the afternoon. Everything looks cheap in this film and McClure spends most of the movie running around fighting stuff all the while having his sleeves torn off in a manly way. It could all be forgiven as just dumb fun, but not enough happened for even dumb fun. All you have is pig people and these Mahars. More killer plants, more strange monsters, lost cities, exotic broads and maybe some sword play are needed to elevate it beyond the unremarkable crud this was. This is one mole machine that spent ninety minutes drilling a hole in my head with the emergency break on.